Redfield bases Applications chart Vintage help. Thread: Redfield bases Applications chart Vintage help. I like to use old Redfield 2 piece turn in SR bases on my bolt guns. They made some Steel, some Dualite and some were Aluminum. sits behind the hump and is a very short block of steel with the 2 windage screws on the sides and the screw mounting holes are 7/16 Center to center. Makes a nice look that I like and is no frills solid as a rock easy to adjust and the less weight of about anything else. I have used up all I have some time ago and I would like to get the correct number for this so I can pursue the hunt for some old stock. They made one as Leupold does now that "jumps the Hump" , Its as bad as using a single piece , just uglier. 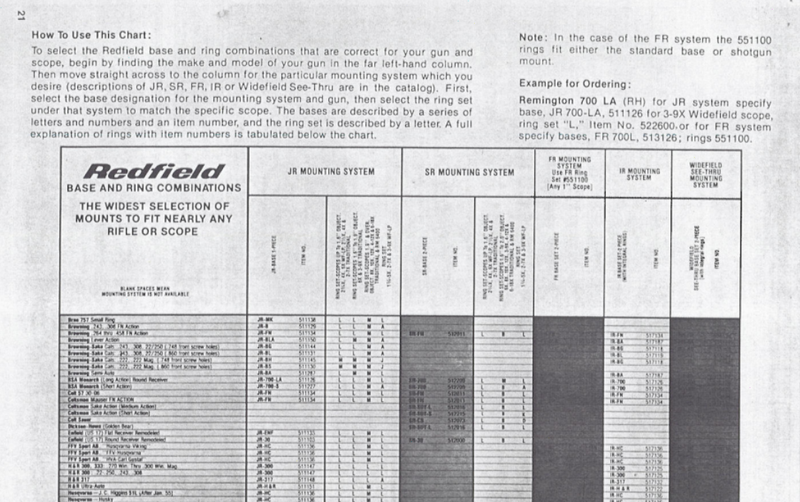 Anyone have an old 60s or 70s Redfield Chart application? I could you a scan of it if possible especially the Mauser applications. Old Shooters Bible and Gun Digest books have the charts you're looking for. Vintage ones can be had pretty cheaply. I would like to have one as well along with a Weaver chart. I don't remember the number, but Leupold did make a short rear section like you are describing for Mausers. I don't remember where I ordered them from, but I used a couple when I was building rifles on VZ24 actions about fifteen years ago. Seems to me the mounting holes were slightly over 3/8", but I don't think they were 7/16" center to center. I do remember it being a pain to get the rear hole just right, I spaced the front hole to work with a one piece bridge mount in case a future owner ever wanted to change thing around. I wish I knew which year the Digest or Bible had them listed. I looked at all of my old ones and not a one had the listing. Yes Robert you are correct about the Leopold's as I had them also, but Leupold is the owner or Redfield and its no use talking with them, there is not anyone old enough working at the company that knows anything about it. I never could make a 2 piece base line up with a one piece ( had the same Idea you had) it always thru the front holes in the reciever in a place you sure dint want to drill them. RayO where did you find that? You ALMOST hit on what I needed. The line that states "Mauser Kar and Swedish after 1906 and Small Ring 95", I need the 5...…. number for the SR mounts not the JR mounts. 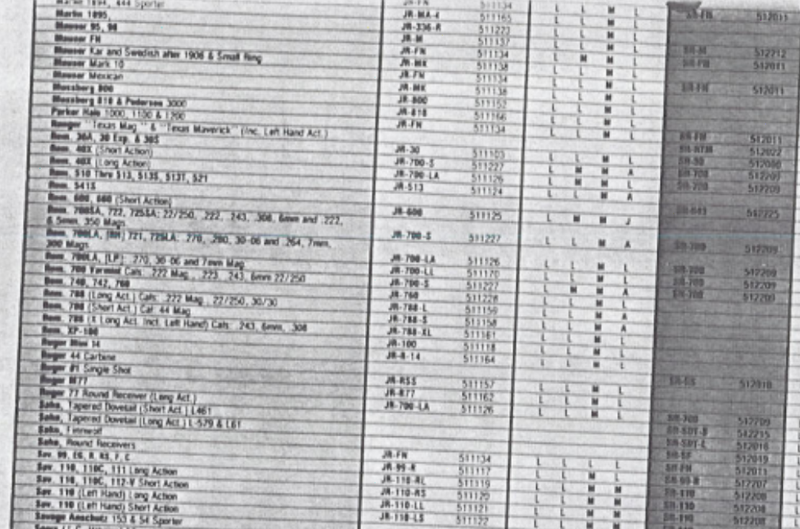 In some of the old charts they also stated the its as "Small Ring Unalter military"
There is no SR number for the application you are looking for on this 1992 chart. Here is a link to a Redfield two pcs mount for 95 mausers. Last edited by MOA; 12-02-2018 at 10:02 AM. 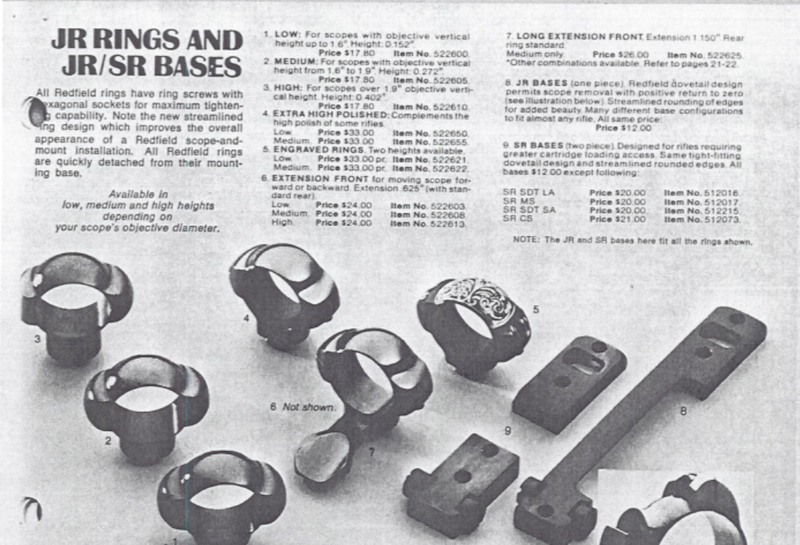 This is from a 1978 Redfield scope and mount catalog. I do not believe Redfield ever made a SR mount for the Kar and 1906 receivers, but that is just my opinion. It might be possible that you are using a two pcs mount that works for your humpbacked receiver that is actually designated for another action but works for your purpose. Any chance you can find a identification number on one of your existing mounts that you can take apart to identify it more positively? Here are their pages I have. You can expand these for a clearer view. The shaded area is designated for the SR mounts and that line is blank. Last edited by MOA; 12-02-2018 at 11:24 AM. MOA you could be very correct, that I used different bases to get the size and height I needed. Thanks for you pictures of the mount pages. I did see or have a chart before maybe before 1978? that listed the SR 2 piece as for Mausers, ex military and stated altered and unaltered. Now I don't know if these Unaltered bases "jumped the Hump" or sat behind them but I did see it and think I used a pair or 2 of them . After pulling the short rear bases form a couple of my rifles they don't appear that I did cut or alter them from anything else if I did I did a good job of hiding it and they ones that were marked had a "M" stamped under them. I can only conclude that M stood for Mauser and the list you posted shows nothing for a Mauser in the SRs and nothing in JR or SR for a 98 Mauser other than the FN parker hales and Mark X . Used to be they always listed the 98s as Large ring. I picked up a couple of sets of the '95 two piece mounts from gunpartscorp. The front base is fine, and fits the receivers, but the rear base is flat both top and bottom, and doesen't fit the contour of the rear bridge either with or without the charger hump. I can use the flat rear base on something else, just thought you'd like the heads up. thank you 405 grain Yep, I fell victim to this too. They don't work, I don't see anything at GPC that will work.